The results to the vegetable poll are in and with a rousing 3 votes, Sweet Potatoes wins. So, here's my favorite sweet potato recipe. What I like best about this recipe is that it's done on the stovetop. I've only got one oven (poor me) and for holidays, like Thanksgiving, it's usually full and I don't have room to roast or bake sweet potatoes. This recipe came to my rescue. If you having ham this Easter, these would be a great compliment. 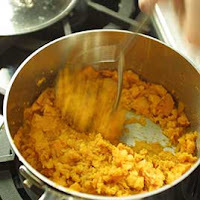 Combine butter, cream, salt, sugar and sweet potatoes in a 3 - 4 quart saucepan; cook covered, over low heat. Stir occasionally, until potatoes fall apart when poked with a fork. 35- 45 minutes. Off heat, mash sweet potatoes in saucepan with potato masher (I just use my small hand mixer and I've used regular butter and just reduced the salt a bit.) Serve. We just had this the other night! Evan is the cook and he also makes sweet potato fries that are AWESOME! That was Kim by the way..I forgot to put my name! My husband LOVES sweet potatoes. I usually boil them and then mash with butter and brown sugar. By boiling them, I'm sure to remove any nutritional value. Will have to try your recipe. Any recipe with cream listed as an ingredient is worth trying.